Sure the Met can always be free, but can you go free, guilt-free? “Two members of the Metropolitan Museum of Art have sued the museum, contending that it misleads the public into thinking that its admission fees – $25 for adults, and less for seniors and students – are mandatory and not simply suggested. (The museum’s original lease with the city specified that it had to be accessible free of charge several days of the week, but the museum says that changes in city policy in the 1970s allowed it to institute a voluntary admission fee. )” New York Times, November 15, 2012. When I lived in NYC in the 70s, the sign said “Pay what you wish, but you must pay something.” Now the sign says “Recommended Admission $25.” “Recommended” is in significantly smaller letters. I was a tourist in NYC in January. I paid the recommended $25. Had I not paid, I would have felt guilty. Tourists pay for things like museums. But had I been able to avoid guilt, would I have liked to get in free? Yes! Bank of America has a way to get in free, guilt-free — a program called Museums on Us®. “Each cardholder gets one free general admission to more than 150 museums nationwide.” The card you need to be holding is any valid Bank of America or Merrill Lynch credit or debit card. “Offer valid the first full week-end (Sat. and Sun.) of the month.” Watch out if you’re scheduling September or December, 2013, where “full week-end” means the offer applies on the week-end of the 7th and 8th, not Sunday the 1st and Saturday the 7th. “Photo ID must be presented.” Forget about lending your BOA credit card to your neighbor. Why do I say “guilt-free”? I’ve not been in a coma for the last 5 years, so I’m pretty careful about reading the footnotes and fine print on any free offer from a bank. Since the rules limit us to one general admission per card with photo ID, I’m betting Bank America is actually paying something for each admission. I think you can be confident that the museum you visit is getting paid and you can enjoy guiltless museum pleasure. Museums on Us® means one free admission at each of 150 museums nationwide. In NYC, just hitting the majors — the Metropolitan, Whitney and Guggenheim — would rack up $65 in admission savings. Meliá runs 350+ hotels, with many choices in Spain (181) and Portugal (14); coverage of major cities in Europe; a good selection of countries in South America; and 9 hotels in Mexico. In the U.S., you can sample the brand in Atlanta, New York City or Orlando. In Spain and Portugal, you can choose everything from golf or beach resorts, airport hotels, and business/conference hotels, to historic properties in wonderfully revitalized neighborhoods. 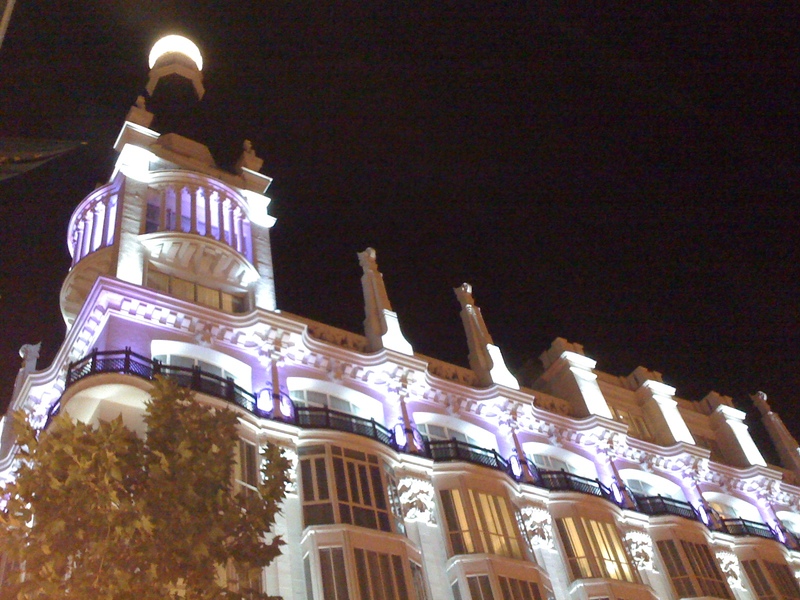 I’ve stayed in Madrid, Barcelona, and Bilboa — each in a great location, each different, each staffed with talented people. I’m not a chain hotel kind of person, but I enjoy this one. MAS Rewards is now MeliáRewards. There are now four levels of membership: MeliáRewards (equivalent to the old MAS Rewards Blue), a new Silver level, plus classic Gold and Platinum. Depending on your level, you earn from 10 to 14 points for every € or $ on your booking (or YHI Spa purchases). MeliáRewards points can be traded for airline points, or used to buy the typical hotel program bling. Every member gets one free night for their birthday, a nice feature carried over from the MAS program. All levels get discounted rates on the Meliá website. In the last six months, this “member discount” has been getting more emphasis, as has their “best rate guarantee.” The website is one of just a few hotel direct sites that TripAdvisor includes in availability/rate searches — an indication that Meliáa is pretty certain their rates are going to stand up to comparison. Sign up. Gold and Platinum are pretty much the same as the old MAS versions except each now has a “number of stays” qualification option — an alternative to “number of nights.” So if you spend $2000 on 10 one-night-stands, you should qualify for Gold. Or you can qualify with 20 nights. Gold and Platinum now also have a path to lifetime qualification. If you want free upgrades at check-in, you ‘ll need to get to Platinum. Gold gets 50% off room upgrades. For me, the one bad thing about Meliá hotels was the charge for Internet access. I suggested that they could make a lot of friends by dropping that charge. I’m pretty certain I wasn’t the only one suggesting that. It’s a little tough for me to understand their exact strategy here, but they seem to be moving toward free access. Depending on the hotel brand and your membership level, you get something between a free hour and unlimited internet. + Platinum officially gets access to Melia’s concierge floor: variously called the Level, Red Level, Royal Service or Deep Lounge, depending on the hotel. Whatever it’s called, “the level” has nice features. – The elephant in the room: points now expire after a year of no activity. Activity can include redemptions, transfers, and the like. Don’t neglect your points. They will vanish. – The 50% breakfast discount, which was quite nice, is gone, replaced by 10%, 15%, 20% discounts (for breakfast, snack bars, and minibars) depending on level. We’ll be looking more carefully at the rates that include breakfast — both good and generous at Meliá properties we’ve visited. – You now need at least Silver for 2 pm check-out. – Gold, which used to get 10am check-in, now gets their room at 11 am. I’m not a spokesman for the chain, but I’m thinking this isn’t going to be a problem. I’ve never asked for anything outlandish, but I’ve never had anyone at a Meliá read me a rule book. I’m pretty certain we once showed up at 10 am in Madrid with absolutely no status, were ready to have our luggage put in storage for a couple hours, and were cheerfully shown to our room. If the staff doesn’t seem to be on your side; if they’re not helping you enjoy your visit; check to see if you’re really in a Meliá hotel. Here is the new “levels” chart with a link to the 2000 point sign-up bonus. Enjoy your stay. After you read this post, you could find my conclusion surprising , so I’m putting it right up front: I recommend you book the Helmsley Park Lane hotel for a stay in New York City. My November plan to visit NYC for a long weekend combining business, museum visits, and food, was destroyed by Hurricane Sandy. The south end of Manhattan was dark. Subway tunnels were flooded. I had reservations at restaurants that were recovering from water or extended electrical failure. I wanted to go anyhow. I wanted to support them as they struggled to recover. But I cancelled. Second (+) The Helmsley Park Lane is located on Central Park South (59th street) between the Plaza Hotel and the Ritz Carlton Hotel. Location, location, location. First (-) We arrived by cab in a drizzle. My wife thought she saw the Helmsley doorman come up to the cab and make a “just 1 minute” signal at the window. I was chatting with the cabbie and paying and didn’t see it. Our taxi driver lifted the luggage out. Hoping the doorman hadn’t been a hallucination, we waited a minute, but no one from the hotel came out or even acknowledged us; so we rolled ourselves inside. My darling, young wife and her suitcase were tangled in the revolving door long enough for someone to notice her and assist her, but no such luck. A powerful NYC Hotel Doorman controls all he surveys. His kingdom includes both generous and demanding guests. His success is the measure of his skill at turning the latter into the former. Through his strong presence, he manages unruly cabbies and cops, hookers and pimps, thieves and vandals. He rules by intimidation, using force only as required, but able to escalate from the whistle he wields when summoning taxis to “whatever it takes.” He is a show of bravado, the ringmaster of the New York City tourist circus. By contrast, our Helmsley doorman was barely visible. I booked through Preferred Hotels to take advantage of a special rate called “50% OFF BAR [Best Available Rate] Continental Breakfast for 2.” It worked out to $280 per night plus $44.80 in NYC taxes. At reception, we were told we could have our breakfast either “on the second floor or in the room.” We decided to try room service the first morning, because “breakfast in the room” being included in a New York hotel is unbelievable! 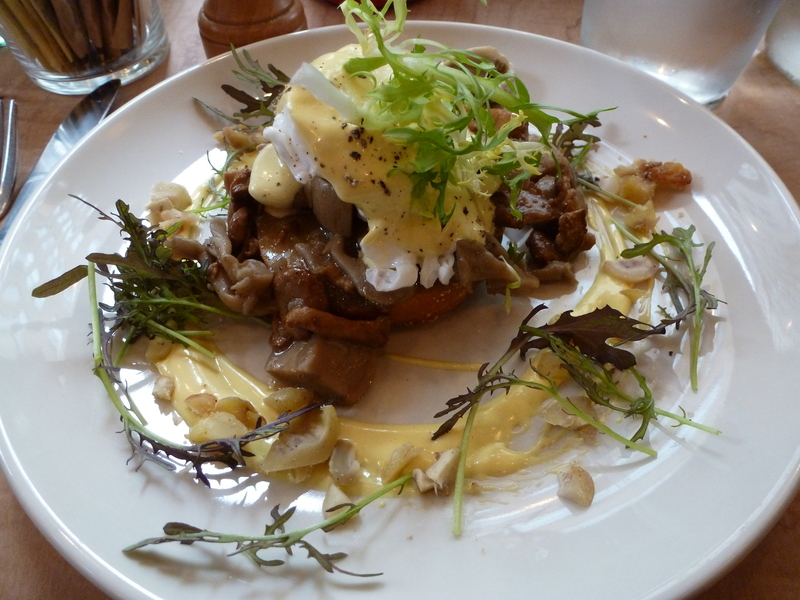 Third (+) Breakfast was excellent — including a choice of juice; plenty of good coffee and hot chocolate; top brand yogurt; choice of toasted bagel with cream cheese or artfully wrapped, euro-bakery-style muffins or pastries; and fresh fruit. We opted for room service daily and were not disappointed. Second (-) The original reception clerk had failed to properly code our Continental breakfast as free, so we got to see the $71.85 [$27 each plus $4 room service each, plus 18% gratuity] charge on our folio before it was removed later that day by Marissa Fourth (+), who was not only helpful and informative but also charming. I guess it’s no big thing for him, but our reception clerk also didn’t even mention we had been upgraded from “deluxe city view queen 7-24” to “city view Executive King 43.” A “when available at check-in” room upgrade is part of my free “I Prefer” membership, but what sort of non-service-oriented dope would miss the chance to charm us with the magic phrase all travelers long to hear, “I’ve upgraded you”? Fourth (-) Where registration really lost it was in failing to tell me that the “Executive” in my “city view Executive King 43[rd floor]” upgrade entitled me to a blue plastic room key, which not only opened the door to room 4315, but was also good for a free drink (anything!) during happy hour each evening in Harry’s Bar. Retail value of that free treat: Dewars @ $13; Bellini @ $19; very good, nightly bar snacks, including mighty-tasty-cheese-puff-ruffle-things @ $priceless. What reception clerk wouldn’t mention every possible benefit of staying at his fine hotel?!? “I Prefer” membership gives me enough status for a high-floor, less obstructed NYC view with a peek at the southeast corner of the park, but not quite enough status to get moved around the corner for a full “Central Park view.” It was January and often so foggy we couldn’t see even nearby buildings, so we could forgo the park view. Room 4315 was a good-sized, old but very clean, typical NYC hotel room, but with giant, east-facing windows. “I Prefer” membership also entitles me to free internet access, but when I try to sign on from the room, I am asked to approve $12.95 for 24 hours access. Later I’m going through the lobby and ask n-s-o guy how to get free access. (You would think I’d have learned my lesson by now.) “Only a manager can approve that. And the manager isn’t here right now. I’ll have him call you.” Fifth (-) I don’t need to tell you that I’m still waiting for that call. Fifth (+) Peggy T, another charming and helpful front desk employee later explained that I should go ahead and sign on. The charge would be removed later. The connection is fast and stable. Sixth (-) The “Do Not Disturb” sign was repeatedly ignored. The room had a doorbell. It rang pretty late one night to announce the delivery of a room service menu — slid under the door. It rang another time; I can’t explain why. Sixth (+) Housekeepers tried to be invisible, but when you met them in the hallways, they were some of the friendliest of the hotel’s employees. These older hotels must be tough. Our room was spotless. I respect their work. Seventh (-) Would you expect that after taking time to write comments on a hotel’s feedback form, placing it in their pre-addressed (to the General Manager) envelope, paying the postage, and waiting two weeks, I would have received an acknowledgement? Not from the Helmsley Park Lane. I found the form in the desk drawer. It wasn’t shoved in my face at check-out with “Thanks! !” and a smiley face added. It looked like hotel stationery, as classy as a feedback survey can be; and I suspect it will never be acknowledged. The Helmsley Park Lane Hotel can excel. It’s not a new, boutique hotel. It’s an old, NYC hotel. Stay there. Just like the city itself, if you can ignore the things that don’t work and can connect with the talented people you find working there, it can be wonderful. Just four nights spent in New York City in January and I once again feel connected to the crazy city. I had expected to rekindle a fondness for the place where I’d spent four years in the 70s. But I’m really loving it more than ever. I’m crazy about the remodeled American Wing at the Met. I’m walking the lower East side ignoring the undulating sidewalks that make walking nearly impossible, just like in the 70s when NYC was falling apart. It’s not exactly like the old days for me. It’s cloudy. I get north and south confused in Soho and walk a couple blocks east when I meant to go west. The city is under construction more than I remember. I don’t recall ever ducking under so much scaffolding. Some things are cleaned up. There’s almost none of the plywood I remember on buildings in Soho. Glass storefronts are back, neatly painted other than black, with new doors and polished handles. When I return home, I’m reading about taxis and fashion week. I’m interested. I’m looking at photos, trying to identify street corners. I’m reading restaurant reviews, comparing reactions to mine or, if I don’t know them, planning a visit, just like I really lived there. We ought to be amazed that the city manages to work at all. We read headlines when things go wrong — blackouts, hurricanes, blizzards. Things are constantly going wrong. I have some sympathy for New York’s almost daily traumas. Certainly, Montana or Colorado have blizzards all the time. California has worse floods and mudslides. New Orleans and Florida suffer hurricanes. New York City, however, seems to get disasters, plagues and pestilences randomly thrown at it. New York City gets all these, plus suicidal terrorist airplanes, blackouts, and more. On any given day, anything can happen, and it does. Like the Helmsley, NYC is for the strong. $399 Non-stop Roundtrip Istanbul from Washington, D.C. — Once in a lifetime?? Update (March 14, 2013): $399 is gone, but there’s a pretty good fare on Air France “Super Spring Sale.” Purchase before March 26 — as low as $667 New York >< Istanbul round-trip. Departures through April 30. I found March 30 >< April 10 @ $691. Most fares are just under $710. Update (February 20, 2013): We’ve been posting about cheap fares to Istanbul since last November, but this one is unbelievable and not well promoted. Buy tickets and start travel by March 7, 2013. Turkish Airways has a $399 fare from Washington, D.C. (IAD) to Istanbul (IST) on its non-stop Flight 8, returning on its non-stop Flight 7. Depart March 6 for 5, 6, 7, or 12 nights. 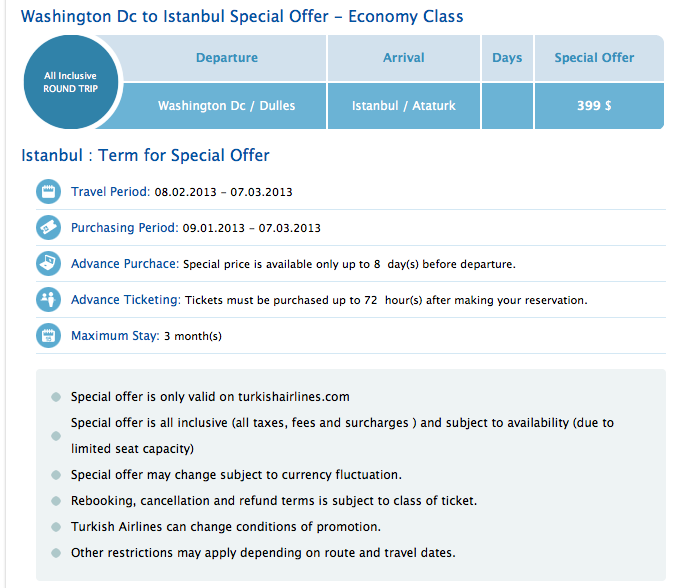 To explore other cheap options to Istanbul ($567 KLM from Chicago, $441 Delta from D.C., $494 from Newark, etc.) use our favorite airfare sleuths at The Flight Deal. Update: February 21, 2013. mas Rewards is now MeliáRewards. Additions include a new level, free Internet in many brands, and contests and prizes during the re-branding. More emphasis on (recently added) discounts for members booking directly. 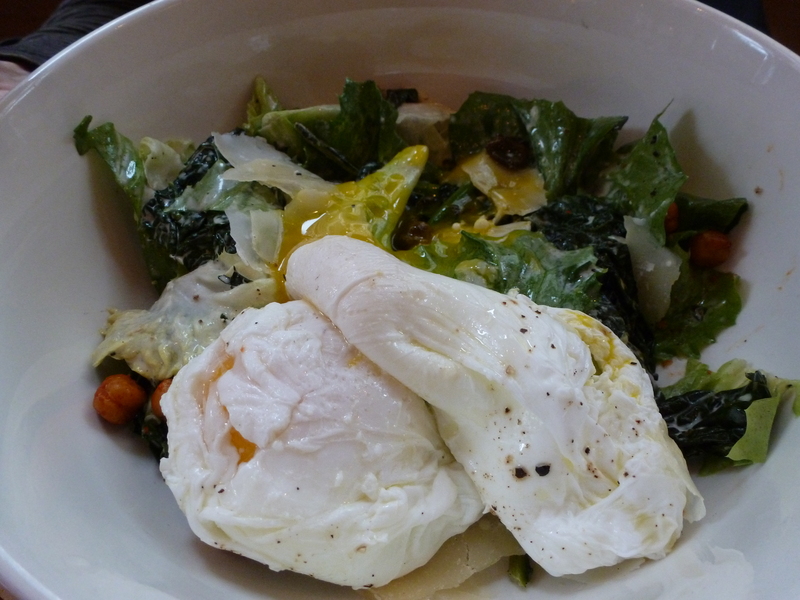 First reaction — only a few downgrades: lower breakfast discounts and expiration dates on points. I first stayed with them over a week-end in Barcelona, then a week around Thanksgiving in Madrid, and this year in Bilbao when we went to see the Guggenheim museum. I usually avoid chains, but Melia employees have won me over. I’m liable to see patterns where they don’t exist, but I was seeing a lot of 6:1 ratios. Rather than wake up some day to find that the Delta Skymiles ratio had gone to 6:1, I exchanged 15,000 MAS Rewards points for 5,000 Skymiles. (I might have picked Lufthansa if I lived anywhere except Cincinnati.) The transfer happened overnight. Once again, I was very pleased with Melia’s service. Carpentras Flea Market — a nice Sunday Marché aux Puces. Here’s how to find it! Sunday midday there’s a nice flea market on the outskirts of Carpentras in a lovely tree-lined parking lot. Since it starts at 10 am, you can visit the market in L’Isle-sur-la-Sorgue early in the morning and then take the short drive up to Carpentras for its combination of art, antiques, and bric-a-brac. 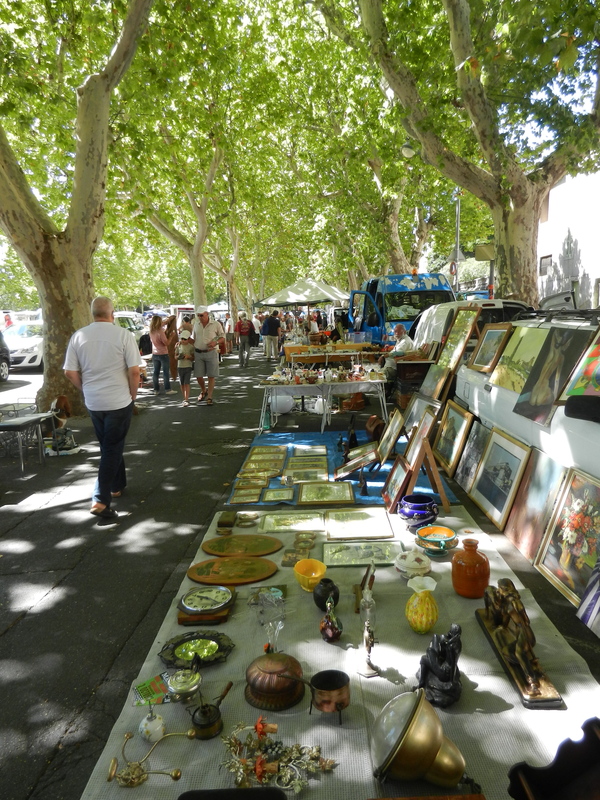 Websites that mention the Carpentras flea market correctly locate it at “Place des Carmes” or “parking des Platanes,” but neither worked on our GPS or Google maps. We found the market at the junction of Av. Jean-Jaurès (D942) and Av. du Comtat Venaissin (D4), just east of the center of the old town. Sandy Price, author of The Flea Markets of France, chose this market as number 8 of 10 she listed in an article for The Guardian.